Well that didn’t take long. The CRTC just launched a review of mobile services, indicating that it was now in favor of allowing MVNOs. This comes just two days after receiving a new policy direction from ISED Minister Bains, and a period of strain in the CRTC’s arm’s length relationship with the federal Cabinet, which had different ideas over competition policy. After sending two displeasing CRTC decisions back for review, ISED Minister Bains pulled the CRTC’s arm on Feb. 26 and gave the Commission a course correction. Much to the dismay of former Industry Minister Bernier, the CRTC had come to effectively ignore the old 2006 policy direction, apart from the obligation to mention it in telecom decisions. It had applied further regulation to incumbents and accorded more legitimacy to leased access. The Commission extended mandated access to last-mile fibre networks in 2015, and claimed that forcing incumbents to share these facilities would promote facilities-based competition (somewhere else — the middle mile). The fact that the Commission was required to tie arguments into knots to explain itself, or could redefine the scope of facilities-based competition to justify shared facilities was not particularly bothersome. The only body that could hold it accountable generally approved of these moves. Once the CRTC (under the direction of its new Chairman Ian Scott) began to behave in ways that made Cabinet uncomfortable, revisiting the policy direction became a way to instruct the Commission on how it was expected to behave. The 2019 policy direction is more open-ended than the small government directive of 2006, signaling that the CRTC can intervene to promote “all forms of competition”. In effect, Cabinet is telling the regulator that it has not been regulating enough, and that competition is still valuable even if it isn’t between competing facilities. Certainly, the CRTC could try to flout the policy direction or interpret it narrowly as it had previously done, but this would escalate the conflict with Cabinet. When sovereignty is contested between the two, Cabinet will eventually have its way. In 2019, the rationality of facilities-based competition has been officially demoted. The move by Bains has the effect of transforming an inconvenient policy failure into a horizon of possibilities. The vague fantasy that competition would lead to overlapping wires running into every home can be abandoned. In its place, consumer interests and competition have been reaffirmed as core values, but competition can be defined differently than before. Facilities-based competition is still an option, and one evidently favored by the CRTC even as it course-corrected after receiving its policy direction. In the Notice of Consultation for the new review, the CRTC is open to a mix of facilities-based and service-based competitors in wireless, but mandated access is still presented as a temporary stepping stone until “market forces take hold”. But according to Cabinet, all forms of competition are on the table, and facilities-based is not the only officially recognized option. There’s still no reason to believe this is the first step to the ‘nuclear option’ of structural separation. More likely, the goal of competition policy will end up being something closer to the status quo than the elusive dream of a competitive facilities-based market. This would mean that mandated access won’t end up being presented as a temporary detour, but as the final destination. Summer is drawing to a close, so it’s back to the usual schedule for me. There was no blog post last month, but if you were paying attention you will know the news that the CRTC has a new Chair. Jean-Pierre Blais is out and Ian Scott is in. I have little basis for predicting what happens next (though the status quo tends to be the safest bet), so let’s look back before we look forward. Blais’ term was served in the context of the internet era. Blais was the first Chair to grapple with a more mature ‘internet ecosystem’ — that is to say, a political economy that is showing some stability around a limited number of giant players: content providers (Facebook, Google/Alphabet, Netflix) and incumbent ISPs. In this respect, he recognized a need to deal with certain issues (net neutrality), and generally avoided making big, stupid mistakes. But as many described it, Blais’ term can be defined by the CRTC’s focus on putting consumers first, which means the industry didn’t always get to decide what was in a consumer’s interest, and incumbents didn’t always get their way in the decisions. This should be situated in a wider context, stretching back to the origins of the CRTC’s regulation of Canadian telecom. In a Globe and Mail article from (Aug. 6) 1976, titled The ‘consumer’s empty chair’, Geoffrey Stevens writes about the CRTC’s new objectives. 1976 was the year the CRTC first assumed responsibility for telecom regulation, which was previously handled by the Canadian Transport Commission (CTC). The change was meant to herald a new era of openness, and would “facilitate the involvement of the public in the regulatory process”, allowing interveners like consumer groups to participate “in an informed way”. It would be a move away from the “court-like atmosphere” of the CTC and towards something more informal. Also, copies of applications would be disclosed to parties that might want to intervene, and telecom companies like Bell would have to disclose information in public that they would previously file in confidence to the CTC (justifications for costs and prices). The last of these was particularly irksome to Bell, whose lawyer subsequently warned the CRTC that such disclosures would hurt the company, and if all competitors had to similarly disclose they would be “hurting each other”. Well, more than forty years later confidential submissions and costing information remains a controversial issue, and Stevens’ question about the “consumer’s empty chair” remains outstanding: who will represent the public interest before the CRTC (or who will pay for the public’s lawyers)? There has certainly been progress, and much of it has been during Blais tenure. In addition to PIAC, there are now a significant number of new individuals and organizations participating in CRTC proceedings through different means. This allows the CRTC to claim broader legitimacy for its decisions, but participants are far from equal, and the Commission gets to decide how much to weigh their opinions. It’s still public participation bolted onto a complex regulatory apparatus, without much in the way of support (or a CRTC website that people can effectively use). At a time when the FCC is experiencing somewhat of a crisis over transparency and openness to the public, the CRTC is in better shape, but still has a long way to go. Over to you Mr. Scott. Last week the CRTC released an important net neutrality policy (Telecom regulatory Policy 2007-104) that got a lot of people talking. There’s been coverage by Dwayne Winseck, Michael Geist [1 & 2], Timothy Denton, Peter Nowak [1 & 2], and foreign reporting that understandably used the FCC’s approach in the U.S. for contrast. Jean-Pierre Blais reflected on the process in a recent interview (in which he also stated that the recent basic service decision was as close as the CRTC could come to recognizing broadband as a human right). I’ve written about differential pricing before, and feel no need to summarize the decision here, or the decision-making framework it establishes, but there are some elements that stood out for me. First, this is the CRTC’s most explicit discussion of net neutrality ever. The term net neutrality didn’t even appear once in the earlier decision on differential pricing, and there has previously been a tendency to frame these topics in the regulatory language of ITMPs. Now the CRTC has embraced common lingo, and the latest regulatory policy is expressly “part of the broader public policy discussion on net neutrality. The general concept of net neutrality is that all traffic on the Internet should be given equal treatment by ISPs” . Elaborating its definition of net neutrality, the CRTC states that “net neutrality principles have been instrumental in enabling the Internet to grow and evolve as it has”. These principles include innovation without permission, consumer choice, and low cost of innovation (low barriers to entry). Here we have the CRTC laying out some internet values — what made the internet so successful and what needs to be preserved (see Timothy Denton’s laudatory post). This document is remarkable because it lays out something approaching an ideal vision for Canadian telecom, with the internet as a central part. There were elements of this in the 2009 ITMP decision, which together with the recent differential pricing decisions (and subsection 27(2) of the telecom Act) now “effectively constitute Canada’s net neutrality code” . For the rest of this post, I’d like to take a closer look at what the CRTC imagines or desires for Canadian telecom, specifically the roles of different actors and their relations. First, ISPs are common carriers , which generally means they are prohibited from discriminating or picking favorites among content. Chairman Blais has since said he thinks this CRTC decision will “reinforce the fact” that ISPs are “mere conduits”, playing a limited role in carrying information from one place to another. Once ISPs start making decisions about content they become gatekeepers to that content, and other concerns come into play (including net neutrality and copyright). Differential pricing can be used for just such a gatekeeping function, which would have “negative long-term impacts on consumer choice” as the CRTC predicts ISPs would make deals “with only a small handful of popular, established content providers – those with strong brands and large customer base” . The scenario that worries the CRTC is one where vertically-integrated ISPs use their control over internet traffic to direct consumers to their own content or that of their partners. Differential pricing is one way of controlling consumer behavior, but arguments in favor of the practice say that it provides consumers with choice, and allows ISPs to innovate and compete through these offerings. In response to these arguments, the CRTC was forced to lay out its vision for innovation and competition. Unsurprisingly, the CRTC’s vision is for ISPs to engage in the noblest form of competition: facilities-based competition: “when ISPs compete and differentiate their services based on their networks and the attributes of the services on those networks, such as price, speed, volume, coverage, and the quality of their networks” . The most important innovations aren’t “marketing practices” like zero-rating, but improvements to ISPs’ networks . ISPs should focus on the internet’s plumbing, and consumers will choose the superior network. While ISPs are imagined to be competing for customers based on the quality of their networks, competition for services is best served by the “open-nature of the Internet”, which allowed “today’s large, established content providers” to grow and innovate. “In the Commission’s view, new and small content providers should enjoy the same degree of Internet openness in order to innovate, compete, and grow their businesses” . Since ISPs are envisioned as pipes, innovation in content should come from the edges of the network (or at least, that possibility should remain open). Content providers need to be able to enter the market and practice ‘permissionless innovation’, by giving consumers what they want without needing to cut a deal with each ISP that controls the last mile . If we are trying to achieve something like a level playing field for content providers, then we can’t ignore the massive advantages that established content giants currently enjoy, and I wonder what else we might do to lower barriers to entry? Perhaps the whole idea of an ‘eyeball network‘ is an obstacle, where the network’s users are imagined principally as consumers watching a one-way information flow. This may be fine if it’s easy for a new content provider to compete for eyeballs, but that’s not the case today unless a you’re depending on an established content service (YouTube, Netflix) as an intermediary by having them carry your stuff. If we wanted to develop new ‘content’ in Canada, we need to recognize that in much of the country incumbent ISPs already act as the gatekeepers. If I wanted to start a new content service from my metaphorical garage, I would only be able to reach the global internet on my incumbent’s terms. These terms might include prohibitions on uses of their network, and the ISP’s control over addressing through NAT (imagine a world where every device could have a unique IP address…). Now imagine if I could easily get fibre to an internet exchange where I could connect to various international carriers… As with facilities-based competition, I think it’s important to try to imagine what an ideal world would look like when we’re talking about innovating and accessing diverse content over those facilities. As with facilities-based competition, I worry that the CRTC is most concerned with preventing existing concentrations of power from getting worse, than taking active steps to realize a specific vision. I spent a weekend re-watching videos of the “Regulatory Blockbuster” from the yearly Telecom Summit. The Summit is a major industry get-together, taking place over a couple of days in a Toronto convention center, with presentations, networking and deal-making opportunities for significant players in the telecom industry. I’ve only been able to attend once, but luckily if you’re interested in public policy the most interesting event at the Summit can be streamed on CPAC, where you can watch the last six years of the Regulatory Blockbuster. The Blockbuster features an hour and a half of telecom industry lawyers (typically from incumbents Bell, TELUS, Rogers, a smaller provider or two such as WIND or TekSavvy, and John Lawford from PIAC) discussing the regulatory issues of the day. In previous years, each participant would get a few minutes at the outset to present what they thought were the most important regulatory topics, followed by questions from the moderator (cartt.ca‘s Greg O’Brien) or the audience. Sometimes the discussion gets a little heated, and it’s worth remembering that the people on the stage can be embroiled in disputes with one another at the CRTC or before the courts. It’s common for participants to point out the self-serving nature of rivals’ arguments, to allege hypocrisy or inconsistency, and to present themselves as disadvantaged victims of government regulation (or lack thereof). As an observer, it helps to understand the underlying conflicts and regulatory proceedings being discussed. However, even without knowing the nuances of CRTC procedure or regulations, the Blockbuster provides a sense of what kinds of issues are keeping industry lawyers occupied. It’s also an opportunity for participants to air their complaints with the existing regulatory regime. In the previous five years, the dominant issue at the Blockbuster has been how government regulates relationships between competitors in the industry, specifically through mandated access to incumbent facilities and wholesale connectivity. Other regulatory issues come and go as they pass on and off the federal government and CRTC’s agenda — lawful access, spectrum auctions, reviews of basic services. But mandated access has endured and expanded since the late 1990s, causing no end of complaints from both incumbents and the smaller competitors it is intended to benefit. In 2010, participants in the Blockbuster offered some analogies of how we might understand obligations under the regime. One likened it to a system in which airlines must reserve a certain number of seats for passengers of competing airlines, or parcel delivery companies are obliged to deliver the parcels of smaller competitors. In Canadian telecom, these obligations generally mean that the large incumbents (including Rogers, Bell, Shaw, TELUS) must allow “independents” (TekSavvy, Distributel, and many other smaller players) to use incumbent infrastructure and to purchase wholesale connectivity at set rates. These rates are meant to ensure that incumbents can profit from this arrangement, but the result is a system where small providers depend on large providers, and both compete for the same customers. The conflicts that result are quite predictable. Small players argue that wholesale rates are too high for them to compete or expand their business, while large players argue the rates are just right, too low, or that mandated wholesale should be eliminated. Because the so-called independents are actually highly dependent on incumbent infrastructure, they must rely on their larger competitors to connect customers and resolve technical issues, such as network outages. Incumbents are therefore obliged to help their smaller competitors address customer concerns, and complainants at the CRTC have argued that incumbents treat competitors’ customers differently than their own. From the outside, the whole setup looks ridiculous — as if it was designed to impose contradictory pressures and inevitable conflict amongst industry players (as well as endless proceedings before the CRTC). But to understand this regulatory regime, we need to consider that it was intended as a temporary framework to deliver us to the mythical land of facilities-based competition. Facilities-based competition remains a myth because the world it envisions has never been clearly spelled out. Instead, facilities-based competition reflects both the persistent drive to create something resembling a competitive market in Canadian telecom following the monopoly era, and a rejection of the sort of structural (and functional) separation practiced in other parts of the world (most notably, large parts of Europe). Facilities-based competition means a telecom marketplace populated by competing networks (facilities): the Bell network competing with Rogers, TELUS, Shaw, and whoever else can afford to build telecom infrastructure. It has never been clear just how many competing networks there should be (with the exception of wireless, where the previous government seemed committed to bringing about four national competitors). However, while incumbent participants at the Blockbuster love to emphasize just how hard they compete with one another, the CRTC has repeatedly indicated that the current state of competition leaves a lot to be desired. Although Canada has hundreds of service providers, their facilities often do not overlap. Incumbents are sometimes classified as operating either inside or outside of their “territory”, and are reluctant to “overbuild” facilities where these already exist in a competitor’s territory (hence, Bell and TELUS have been repeatedly criticized at the Blockbuster for “sharing” facilities in their respective territories). Smaller competitors have sometimes wondered just how many competing wires the world of facilities-based competition imagines going into each home, and where the money to build all of these competing wires is meant to come from. The CRTC has tried to address the inadequate state of competition in Canadian telecom through the mandated wholesale regime. The original idea (known as the stepping-stone or ladder-of-investment theory) was that small competitors could use the facilities of incumbents until they grew to have competing facilities of their own. Once some adequate number of competing facilities had flowered, the hand of regulation could fall away, and the market would take care of the rest. However, this never happened. Instead, mandated access seems to be here to stay, and regulators talk a lot less about facilities-based competition than they used to. Since 2006, we’ve seen a decade of continued mandated access, and a gradual acceptance of the fact that this regulatory approach is here to stay, even if we’re not clear on what the outcome is meant to look like. The recent expansion of mandated access to fibre seems to aim for a world of competing “middle-mile” networks, since the CRTC recognized that competitors “cannot feasibly or practically duplicate” last-mile wired networks (the part of the network that physically runs into your home). I should note that the ghost of Maxime Bernier haunting the CRTC is just the imprint of his time as Minister of Industry between 2006 and 2007. The man himself is very much alive, seeking the leadership of the Conservative Party, and also spoke at the 2016 Telecom Summit. There, he lamented that the CRTC “seemed to take the Policy Direction seriously for a few years” before it “reverted back to its old ways”. Echoing incumbent positions at the Blockbuster (and deploying the wisdom of Ronald Reagan), Bernier asserted that the CRTC had failed to recognize just how much competition there was in Canadian telecom, which led him to conclude that the Commission should get out of telecom regulation altogether. At the 2016 Regulatory Blockbuster, there were no calls for the CRTC to get out of regulating telecom competition and wholesale access, but incumbent participants gave their usual warnings about the harms of regulation, and much of the discussion was about what the role of the CRTC should be in these times. The first set of opinions was on Chairman Blais’ remarkable statements about digital strategy during the Basic Services hearing. Then (after a suggestion for CRTC procedural reform floated by Mirko Bibic), discussion turned to Commission’s relationship to industry and the public. Incumbents expressed the desire for a better way to sit down and talk with the CRTC, and even PIAC’s John Lawford voiced agreement that things had gotten out of hand in recent hearings — with so many diverse voices pulling the discussion every which way. The Commission has tried to do a better job including the public, and recently numerous people have been engaging with the process for the first time. Admittedly, hearings would run more smoothly if there was a single voice speaking for the public interest, but that’s not the direction things are headed. The rest of the time was spent discussing those topics that have come to the fore depending on the regulatory cycle and the whims of politicians. The biggest of these was the Basic Services review (and how to fill various gaps in connectivity), but Quebec’s Bill 74 also came up for discussion. While most Canadians haven’t heard of this issue, telecom lawyers are seriously worried about what it means for a province block websites in order to maintain control over gambling. So what do you learn from watching close to ten hours of Canadian telecom lawyers on a stage? First, as someone who tries to study changes in telecom policy, the archive of these videos is a very valuable resource, for which I’m grateful to the Summit organizers, CPAC, and the participants who put themselves up there each year. Secondly, some new regulatory issues come into play at each Blockbuster, and some things stay the same. Facilities-based incumbents are going to keep advocating for facilities-based competition, but in 2016 this means pointing to a previous era in telecom policy. Incumbent representatives at the Blockbuster like to fondly remember previous iterations of telecom regulation (remember when government said it would let the market sort things out? ), because today’s regulatory environment seems more hostile and just plain confusing. What was once meant to be a temporary scaffold (mandated access) has become an enduring regime. Facilities-based competition was once the goal of regulatory liberalization, but at the CRTC it has now either shifted in meaning (from the last mile to the middle mile), or describes some competitive ideal that will always be out of reach. Since there seems to be no appetite for getting rid of mandated access regulation on the one hand, or for doing away with the goal of competing private networks on the other, this ambiguity seems set to continue for a long time. Today, we learned what the Government of Canada thinks about Bell’s petition to overturn the CRTC 2015-326 Telecom Regulatory Policy, which will open fibre networks to wholesale access. I’m not sure if anyone is surprised by this decision, since there were no indications that the Liberal cabinet (namely, Navdeep Bains, Minister of Innovation, Science and Economic Development) was predisposed to favour Bell’s position. In fact, there hasn’t been much indication of what the Liberal government’s stance is on telecom policy, or how it differs from the previous government. As a result, many are looking at this decision as a “first hint” of what to expect. First, cabinet recognizes that “wholesale broadband is a proven regulatory tool for enabling retail competition in the Internet service market”. This aligns with the increased legitimacy granted to wholesale access by the previous government, along with the CRTC’s decisions in recent years. The wholesale access regime is no longer imagined as some temporary stepping stone to facilities-based competition; mandated wholesale is here to stay. If the CRTC wants to focus the scope of facilities-based competition on the middle-mile, that’s fine, but this government values retail competition and consumer choice. This government also seems to be playing it safe and leaving its options open. Supporting the CRTC is the default choice for cabinet, and there’s no strong reason or principled policy here for doing otherwise. The language used by the Minister echoes the Conservatives’ consumer-focused telecom populism, but it also indicates that the government’s telecom policy boat is maintaining its current heading. If this continues, the Liberals could simply avoid leaving their mark on telecom policy and manage the file according to a familiar pattern: espousing the importance of competition, supporting access to incumbent facilities, and distributing one-time injections of funding to individual broadband projects. The other option would be for the Liberals to do something distinctive, which is probably what CRTC Chairman Blais was hoping for when he brought up the lack of a broadband policy in this country. There’s still no reason for me to believe that any distinctive digital policy in the works, and if it is, it will likely be a long time coming as the Liberals have plenty already on their plate. In the short term, the Bell-MTS deal could be another opportunity for the government to spell out what its vision of a competitive telecom industry looks like. However, my guess is that we will learn more from the government’s decision in that deal than whatever brief statement accompanies it. The CRTC is currently in the late stages of its review of basic telecom services, intended to “examine which telecommunications services Canadians require to participate meaningfully in the digital economy and the Commission’s role in ensuring the availability of affordable basic telecommunications services to all Canadians“. This review has been proceeding through written submissions for the past year, but is currently wrapping up the public hearings phase. You can watch these on CPAC through the video archives, or read transcripts of the presentations and the back-and-forth with the Commissioners. What is all of this about? Given the scope of the review, this is not an easy question to answer. First of all, it has become blindingly obvious that some level of internet access is required to “participate meaningfully” in society. This “self-evident truth” was expressed by CRTC Chairman Blais early on in the hearings. The question of whether broadband is a “want” or a “need” has shifted to more detailed questions around what sorts of minimum speeds (or other performance indicators) are needed, or what kinds of networks Canadians require. Should obligations to provide a certain level of connectivity be imposed on some intermediaries, or can we make do with “aspirational targets”? If obligations are imposed, who should be obliged, where, and to what standard? How much will it cost, and who should pay for it? There’s been a lot of talk during the hearings about reaching those populations who face persistent challenges, including rural pockets that have been bypassed by the spread of connectivity. Connectivity for low-income populations has also been discussed repeatedly, since the digital divide carves through urban areas as well as the countryside. Surprisingly, digital literacy keeps coming up in questions from the Commissioners, an area that has rarely been a focus for providers, or covered by their support for MediaSmarts. All of this is interesting because the long-standing criticism of the digital divide concept was that it was overly concerned with the technical provision of access, and failed to consider the social obstacles, such as skills (digital literacy) and ability (including cost). Well, the CRTC is certainly thinking about these things, but actually regulating in these areas would be something new for the Commission. Perhaps the most remarkable thing about the hearings has been the diversity of the participants. Speakers have included major and minor connectivity providers, as well other stakeholders. Since the ultimate stake is connectivity for the nation, the entirety of Canadian society is effectively a stakeholder, and written submissions have come from far and wide. The CRTC has agreed to hear presentations from advocacy groups, consumers, campaigners, policy wonks, not-for-profits, and populations at the thin edges of our networks. Some of these participants have appealed for very broad government interventions, and been pressed by Commissioners’ to comment on specific broadband targets or implementation strategies that the CRTC might actually have a role in. Given my Alberta roots, it was especially interesting to see Axia’s Art Price present his regulatory vision, which understandably coincides with the business model the company is already pursuing in Alberta. Alberta’s SuperNet was held up as a model for the sort of “community interconnect grid” that could be pursued elsewhere. During the question-and-answer, Price noted the provincial government’s current lack of attention to issue, and sidestepped the question of what happens when a backbone is built but no one steps up for the last mile. Cybera’s presentation earlier today led to a more mixed view of SuperNet through the questioning of Commissioner Vennard, who has some experience with the history of this project. It’s also been good to get a chance to hear from some of the hundreds of intermediaries scattered across the country, including ILECs, SILECs, IISPs, WISPs, cablecos, satellitecos, non-profits, regional networks, and co-operatives. I’ve tried to get a good sense of the diversity of these institutions through my research, but there’s still plenty of smaller ones out there that I’m obviously not aware of (like Chebucto Community Net). The incumbents and their facilities may be key to anything that results from this proceeding (because that is where new targets and obligations really matter), but it’s important not to overlook these more local institutions that have their own particular perspectives. 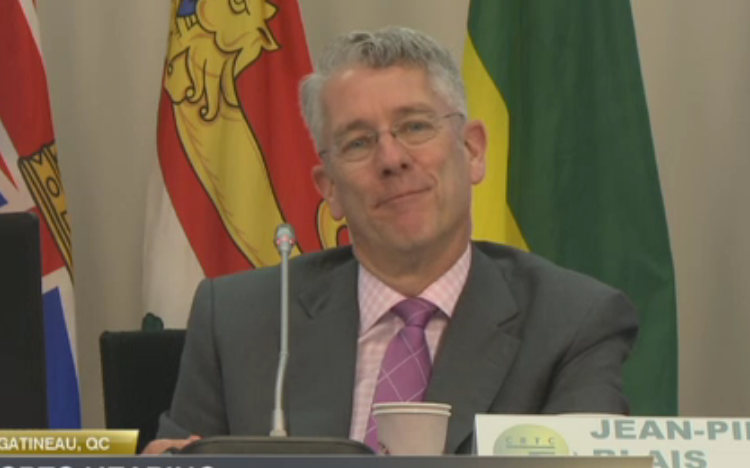 One remarkable part of the hearings was CRTC Chariman Blais’s address on April 18, in which he stated that the review might be the “last best chance to get it right – a chance to create, together, a coherent national broadband strategy“, and that the CRTC would be “taking some leadership on defining the strategy“. This is the sort of leadership that has long been lacking from the federal government, and indicates a role for the CRTC beyond simply tweaking existing rates, incentives, and obligations. So where will all of this lead? The range of actions the CRTC could decide to take (after the Commissioners have time to digest the whole process) is nearly as broad as the scope of the review. There has been some discussion online about what authority the CRTC could use to impose obligations for new networks, but various models for a way forward have been proposed by participants in the process, and any decision by the CRTC can generate years of dispute about its basis in regulatory law. The CRTC could also do nothing at all, and may feel like it has little ability to address these problems. After all, the Commission can’t fund the infrastructure itself, or ask the federal government to do so. The CRTC gets to set the rules under which intermediaries operate, through obligations and incentives, and it has never been the role of the Chairman to develop a “digital strategy” for the nation. While we probably won’t end up with a government-funded open-access national fibre backbone, a new crown corporation, or obligations for incumbents to extend fibre across Canada’s north, it does seem that the CRTC will at least do something that looks significant. Given the comments of the Chair, and the Commissioners’ demonstrated understanding and recognition of connectivity problems, continuing with the status quo doesn’t seem to be an option. There will have to be a move that promises to address at least some of the remaining technical (territorial) gaps in connectivity. However, any action that’s truly ambitious here will mean the CRTC carving out a new role for itself. I think that without Cabinet support, a new national strategy or a new leadership role for the CRTC just doesn’t seem that likely. For most people, internet performance is a mystery. Many subscribers do not even know the level of bandwidth they are paying for, let alone how to test if they are actually receiving the sorts of speeds their ISP advertises. Canadian regulators have often been in the dark as well, which is a problem when their decisions are supposed to take the availability and geographic distribution of broadband into account. Regulators have traditionally depended on information provided by industry as a basis for policy decisions, but this information can be inaccurate or incomplete. There are ample cases in the US and Canada where certain regions have been listed as having access to a certain level of broadband, or choice of ISPs, whereas the reality on the ground has been far less than what is supposedly available. This problem is not unknown to regulators. Network BC, working with Industry Canada and the CRTC, launched its broadband mapping initiative in 2014. This included consultations with the various ISPs spread across the province to determine what services where actually available in what locations, resulting in an interactive connectivity map. Industry Canada watched the efforts in BC closely, and is currently soliciting information from ISPs to carry out a national broadband availability mapping project. However, such efforts to not include any independent means of actually measuring internet performance in these areas. The big news in recent weeks has been the entry of new players in the internet metrics game. First, CIRA kicked off its own broadband mapping effort, which anyone can participate in and provide information to (an appropriate browser/OS combo may be required to participate). The map is very much a work-in-progress, which will fill out as individuals add more data points, and as new features and methods are added. Not long after, the CRTC announced its own internet measuring initiative. This is new territory for the CRTC, which has never had much of an ability to independently investigate or collect data about the telecom industry it regulates. However, the plan has been in the works since at least 2013, and may be based on the FCC’s Measuring Broadband America project, which has been underway since 2011. As in the US (along with Europe, Brazil, Singapore, and other nations), the CRTC’s program depends on the use of the SamKnows “whiteboxes” deployed at participating locations (the CRTC is currently looking for volunteers to receive and set up the devices). These devices measure connectivity between the subscriber’s premises and major connection points between ISPs. There are a number of concerns (see here and here) with the CRTC’s efforts. ISPs could try to “game” the metrics to make their network’s performance appear better (ISPs know which of their subscribers have the boxes, since they use this information to make sure the testing doesn’t contribute to a subscriber’s data cap). SamKnows might only measure internet performance in off-peak hours, when connectivity is less likely to be a problem, since the boxes are intended to operate when subscribers aren’t making full use of their bandwidth (on another page, the CRTC has gone even farther to say the information will be gathered “when users are not connected”). Not all ISPs are participating the program, raising the concern that smaller players and rural areas that are most disadvantaged in terms of connectivity are being left out. This last point relates to the importance of having a representative sample, which is a fundamental precondition for any survey that attempts to calculate meaningful (or generalizable) statistics. All of the above can be addressed with a properly designed methodology, full transparency of these methods, and careful qualification of the results. Here, the CRTC has plenty of international examples to draw from, and SamKnows has built its business around such openness, but we will have to wait for more details to weigh in on whether this particular partnership has done a good job. Finally, it is important to realize that no test can ever truly gauge the speed of “the internet” from a given location. Typically, the best that can be achieved is a measurement from a subscriber’s home to a “major internet gateway”, where an ISP connects to the rest of the world. The ISP has no control over how fast the rest of the world’s internet is, and limited control over the performance of services that aren’t hosted on its network. Even the fastest gigabit networks are no faster than their connections to services “upstream,” like Netflix – a problem the FCC had to contend with as it tried to measure the performance of ISPs that were engaged in peering disputes that limited their connections to the streaming service. Ultimately, all of this indicates a broader trend towards data gathering to erase some of the mystery about how the internet actually “performs”. For individuals, these are welcome steps towards becoming better informed about what one’s ISP actually provides, but also about what goes into determining internet speed or performance in the first place. For regulators, accurate and comprehensive information is a precondition for effective public policy, and it’s great to see Industry Canada and the CRTC taking steps to refine the picture they have of Canadian connectivity as they come to decide important questions about the future of Canada’s internet.